Embarkation went quite fast. 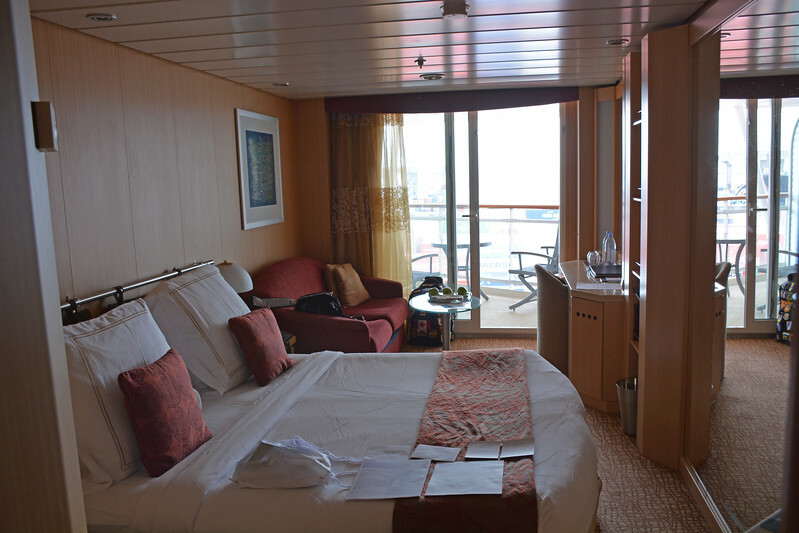 We arrived around 1 PM and were on board the ship within 30 minutes, following security screenings, and check-in. 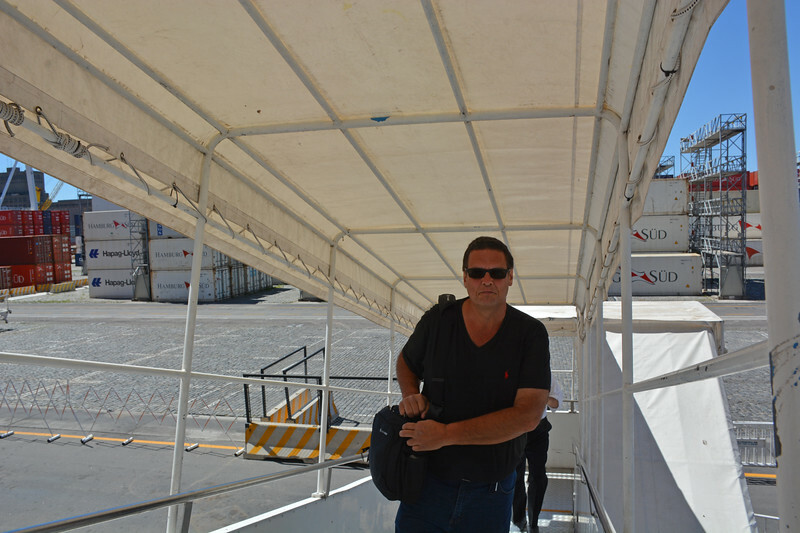 No issues, what-so-ever embarking at the port of Buenos Aires. We had the choice of using the ELITE check-in line OR the AquaClass priority line. Both were empty (no queue in sight). The room was well laid out with plenty of storage space, “if” you were a wee bit creative. After unpacking, we opened up our suit cases (into halves) and slid them under the bed (tucking them away). We used every nook and cranny available within the room and made it work. Definitely much smaller than a Sky Suite (especially landscape between closet door and bathroom door) and also the space between the bed and the mirror. It took us a few days, but we got used to it, developed movement patterns and then enjoyed the room to its full potential. 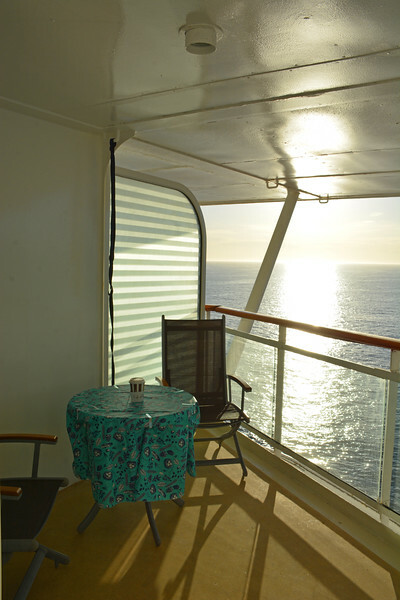 The balcony of 9038 (and its sister, 9043) is the largest balcony of the AquaClass rooms on Deck 9. We used it often! The only downfall of this room was it was during a Holiday Cruise with a late-night party crowd. As the temperatures fell, the crowd moved from the pool area to the warmer Solarium and we had “extensive” noise issues (i.e., herd of wild elephants above us) that distracted us from fully enjoying this room. It was quite a shame, as the location of the room (close to elevators/stairs, proximity to spa, and the large balcony) was tainted. Would we ever choose this room again? unfortunately not, due to the extensive noise issues throughout the cruise (we did call for Security on many occasions!). It was quite unfortunate, as again – the room itself was perfect for us – just not the noise from above. Our stateroom attendant, Albert, was good and attentive. 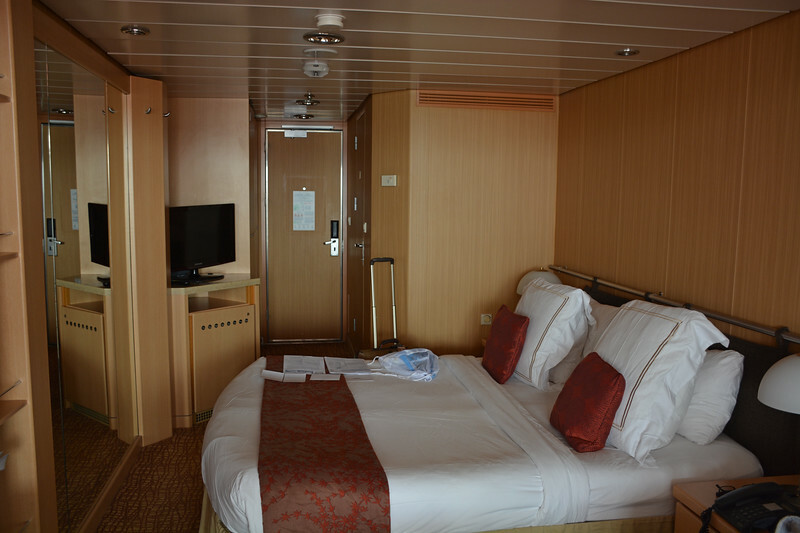 We had to ask for face towels and bathrobes (not supplied upon embarkation); but they were delivered promptly. Infused tea was never provided. However, upon request, we did receive a Tea Kettle for which we made fresh tea each day and enjoyed on our balcony. We also requested a foam mattress cover to increase the comfort of the bed, and extra wire hangers (which were again kindly provided). This would be our first time dining in BLU as an AquaClass guest. We have previously dined in BLU on board the Celebrity Constellation as Suite guests (space available basis); but this trip, BLU would be our main dining venue. In summation, I have to say that after 15N, we were totally impressed with the offerings from BLU. 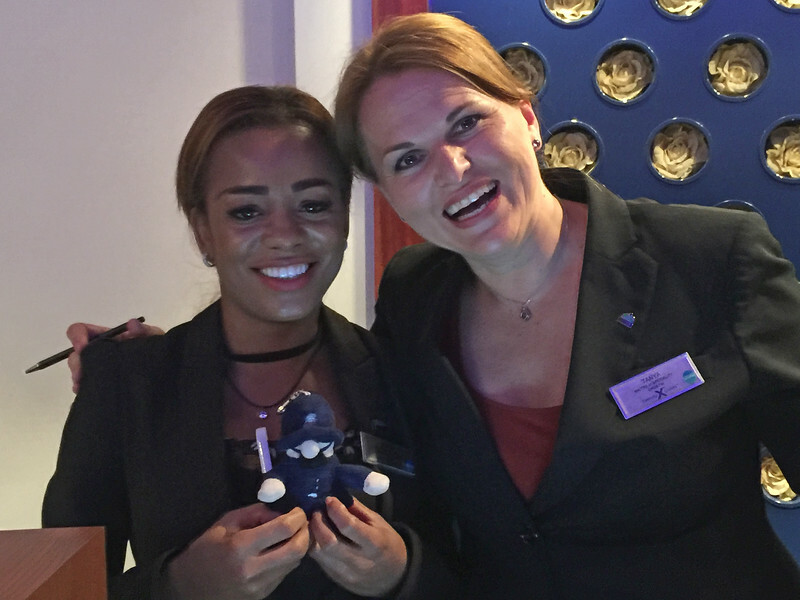 The staff were led by Maitre’D, Tanya of Croatia, and she did a stellar job of managing her crew. Efficient, polite, courteous, helpful, – our accolades could not go far enough. It did not matter where we were seated, each waitstaff was equally as brilliant and helpful. 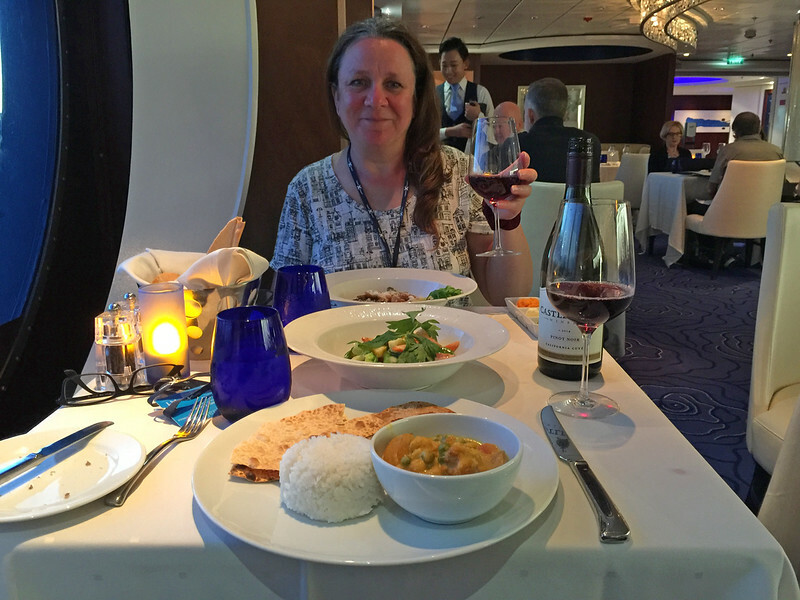 As vegetarian cruisers, our selections can be quite limiting (just look at a menu and look for meat-free options); but the BLU staff always provided not only the BLU menu, but the Vegetarian menu from the MDR as well. No questions asked. They also were quite accommodating when we had special requests (e.g., can this salad be made without meat, can this soup be ordered without bacon, can this pasta be served without clams, etc.). They never said NO! and it was always “with pleasure”. 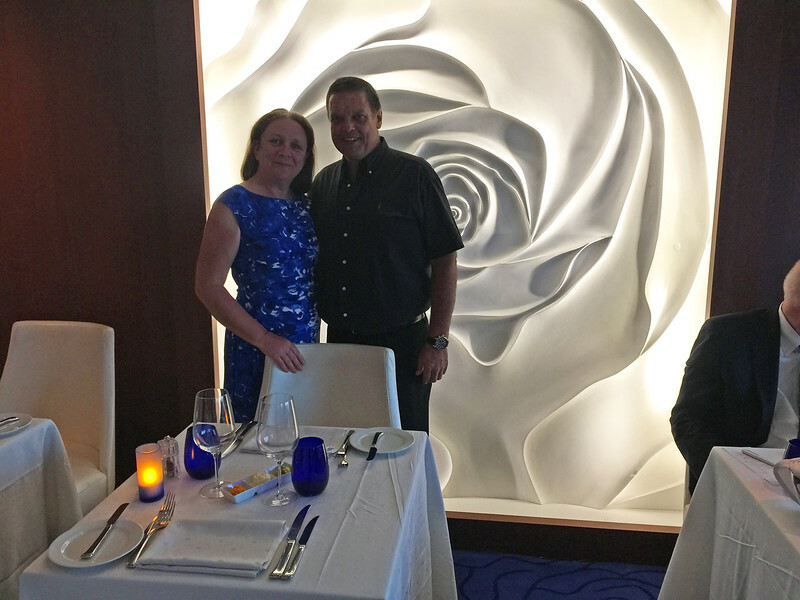 We were absolutely impressed and quite honestly ordered less off the MDR vegetarian menu and more from BLU – as compared to our experiences in Luminae (Suite Dining). This statement is in no ways disrespectful to Luminae, only an observation that vegetarian dining was more “fruitful” (pun intended) within BLU. Our Sommelier, Fernando, within BLU was second to none. Of ALL the Celebrity Cruises we have taken, he was simply the best. 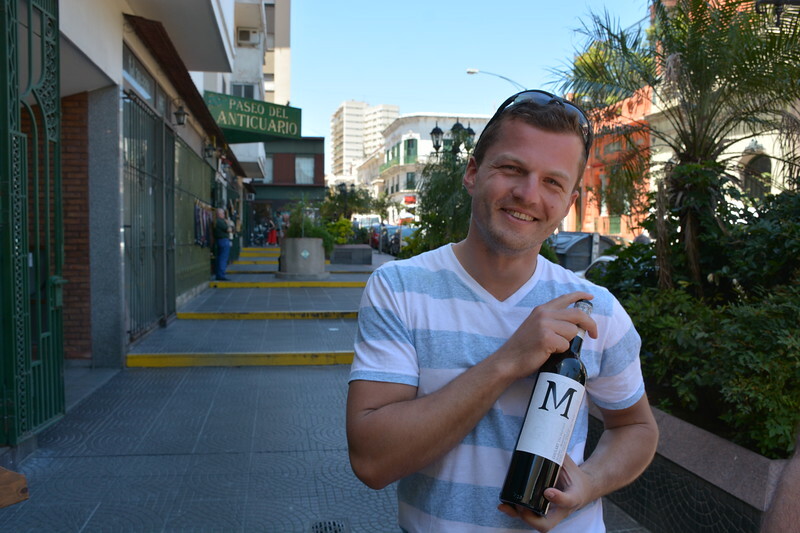 Anthony, who rarely partakes in drinking wine with dinner, began enjoying the selections that Fernando carefully presented to us. Fernando is a Celebrity Secret Gem and we wanted to take him home with us. 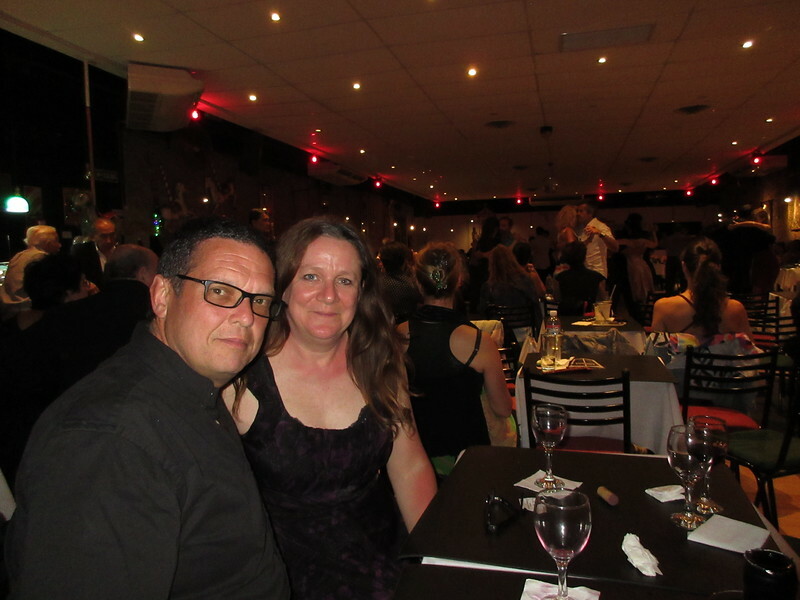 Sadly, Maitre’D Tanya said, we simply could not – ha ha ha. Overall – our first, mid, and lasting impressions of BLU on board the Infinity was a 10/10 rating. There was never a “wait” for a table, always greeted by our names, and with a smile. The service from both wait staff and our sommelier, was outstanding. BLU was our refuge on board this ship. 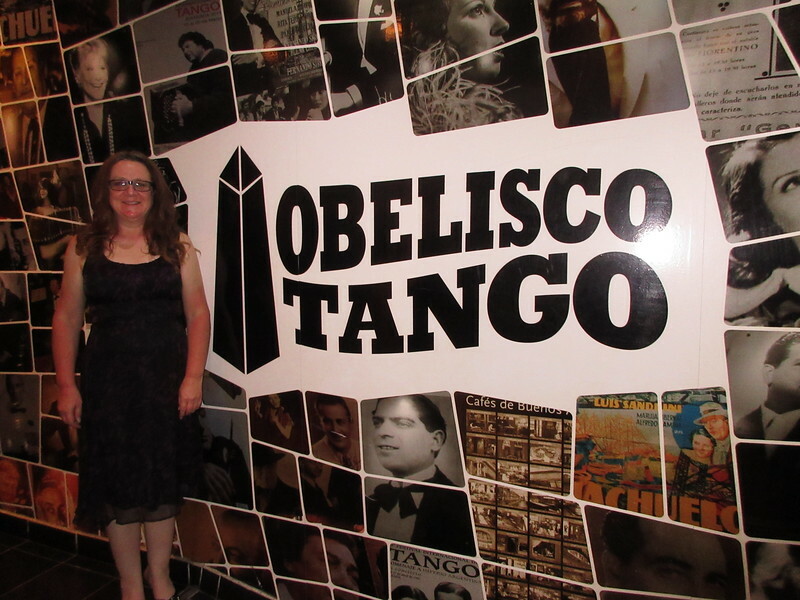 The first club that we visited, Obelisco Tango, was a very formal club which follow traditional tango codes of conduct. Therefore, beginners are discouraged from the dance floor. Our guides explained all the codes while we were watching and it was not only very educational, but fascinating! with our blessings (permission), both of our guides went up at separate times (accepting an invitational glance, with acceptance via a nod) and we were able to watch them tango. The video below shows the end of the tanda (set of songs, usually 4), men choosing new partners, and another tanda set begins. The second Milonga that our guides took us to, was a complete contrast to the first. This club had no rules, beginners most welcome to join on the dance floor, and it had a completely different atmosphere! One of our guides (Lucia) offered to teach me the basic walk (since there were no rules that prohibited teaching at this club); and I graciously accepted! What an experience!!! 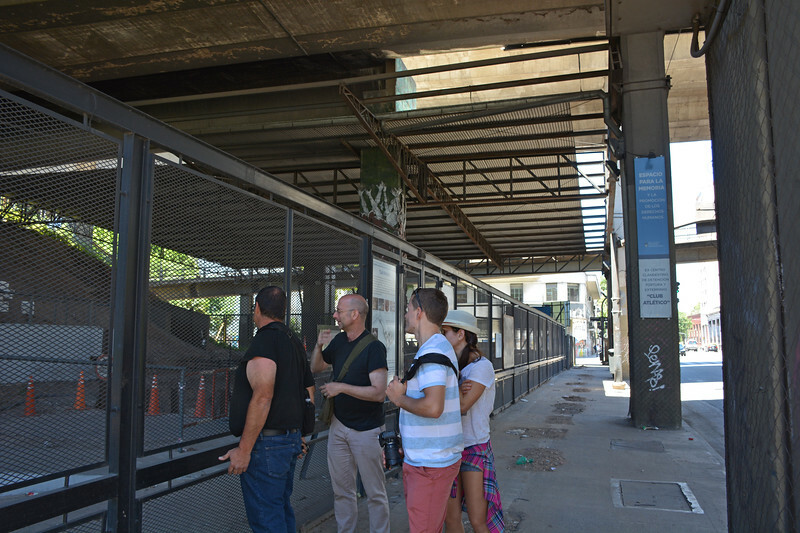 Highly recommend this tour (via tangotrips.com) to anyone visiting Buenos Aires in the near future. Guides were amazing – we all learned so much, and had such a brilliant time. 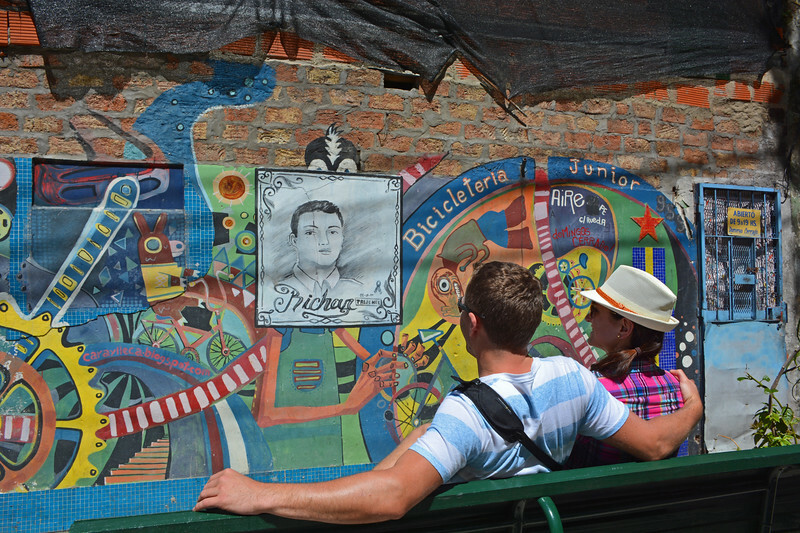 Our first destination with Richard was “La Boca”, one of the poorest barrios (neighbourhoods) within the large city of Buenos Aires. However poor this “barrio” is, it is rich in fame for its colourful houses, pedestrian walkway, and beloved soccer team. 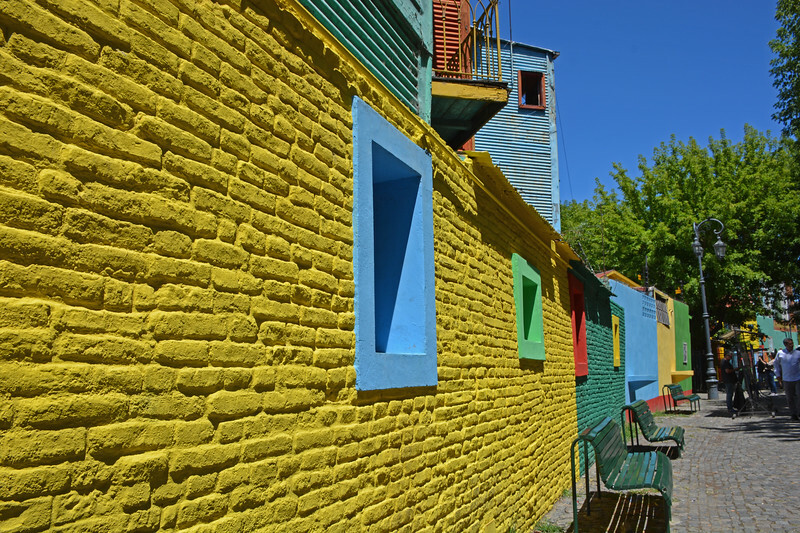 As “La boca” translates to ‘the mouth’ in English, this barrio is thought to be named because of its proximity to the mouth of the river, Riachuelo. 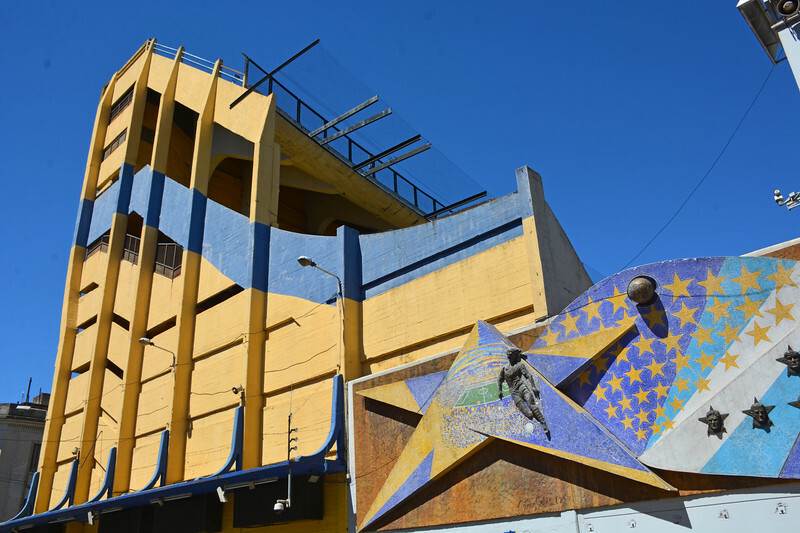 We began our walking tour near the soccer (fútbol) stadium, La Bombonera (chocolate box). 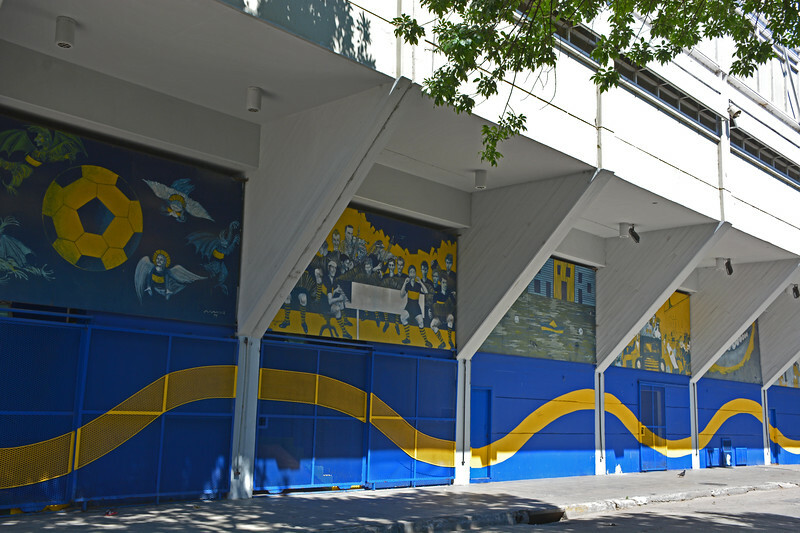 The stadium is home to the world famous Boca Juniors, of which Argentinian hero Diego Maradona, played prior to his FIFA fame. Note for safety reasons – do not wear a “River Plate” shirt to this area; that would be just asking for trouble, as this team are the sworn enemies of the Boca fans! The sheer vertical incline of the stadium is something to see (vertigo anyone? 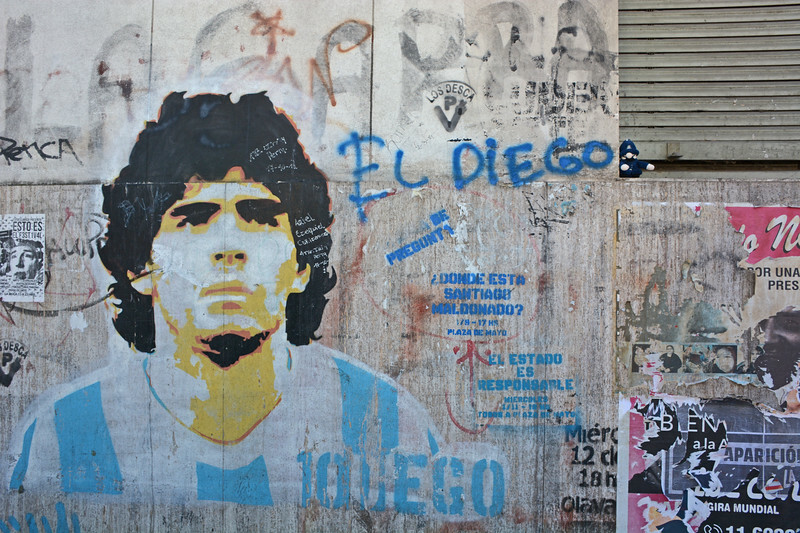 ), as well as the great graffiti that adorn the outside stadium walls. 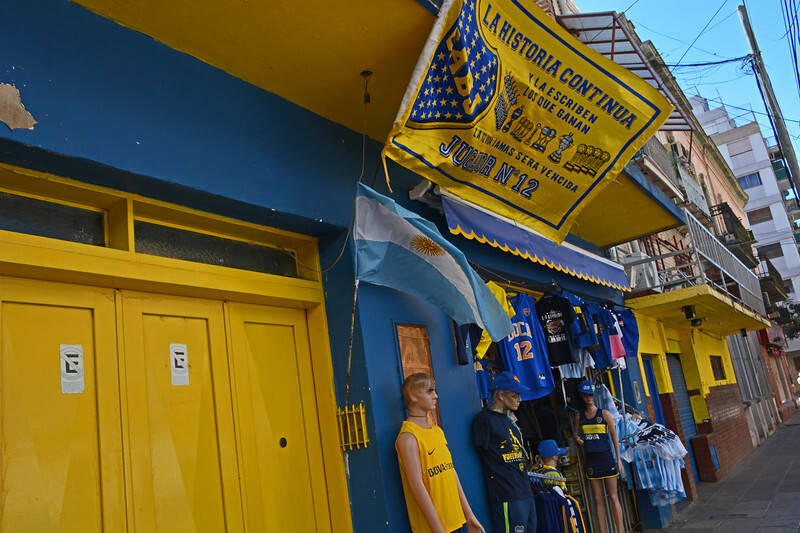 Surrounding the stadium are shops and cafes that are adorned in the Boca Juniors famous colours of blue and yellow. Soccer attire and paraphernalia is readily available in this immediate area, you cannot miss it! No shortage to purchase Boca Juniors apparel! 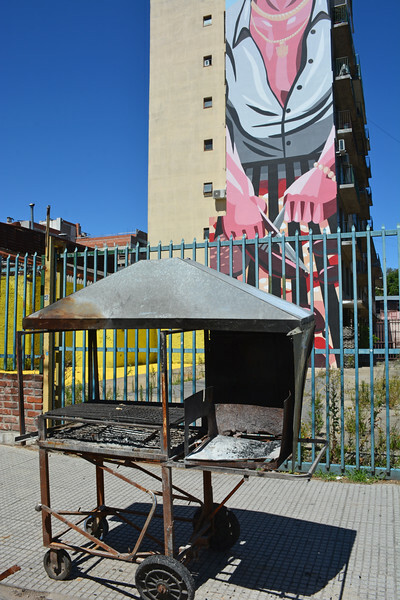 As we walked past the stadium amongst all the soccer flags, sports gear, and general “fan”dom, we approached a small cafe, Ribera Sur, that is a favourite personal stop of our guide, Richard. 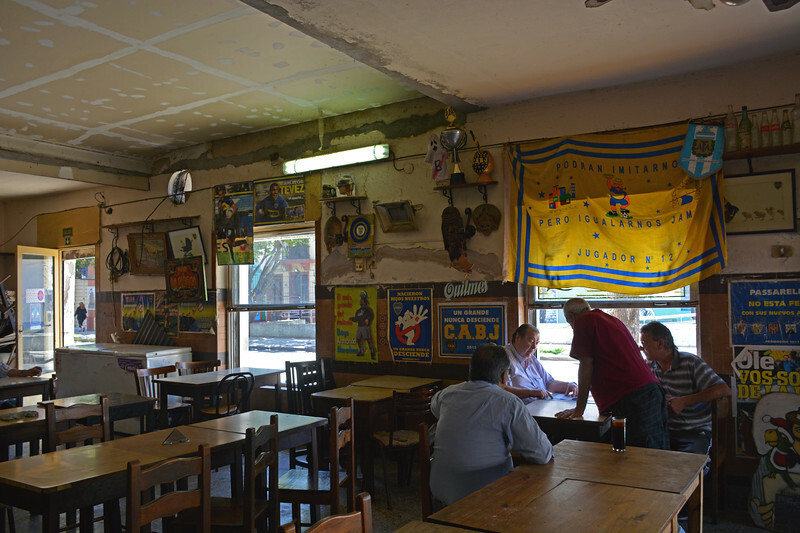 We entered the small cafe and felt as if we were taken back in time to an older, less touristic, Buenos Aires. We could see how this cornerstone cafe could easily become a favourite local hideaway. 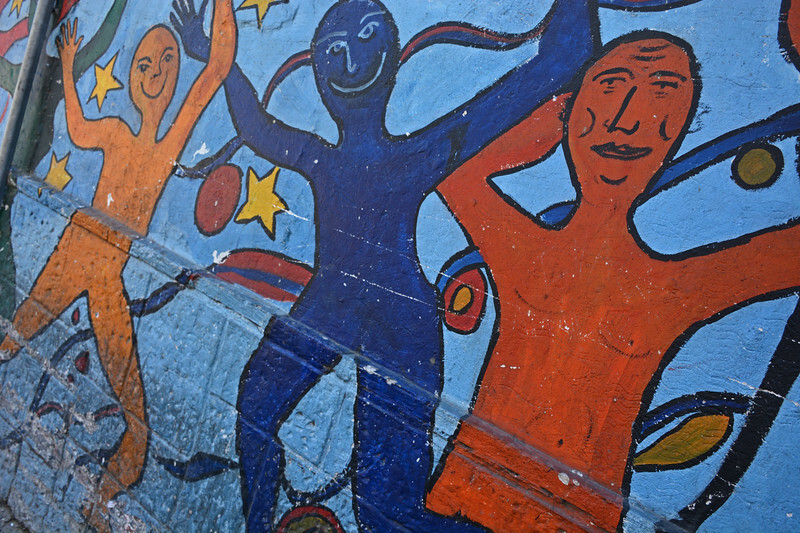 Following the cafe, we continued to walk with Richard, admiring the street graffiti which ranged from soccer fan adoration, to political messages, to simply wonderful art! Photographic moments were plentiful in this area a little off the beaten path of the tourist centre. 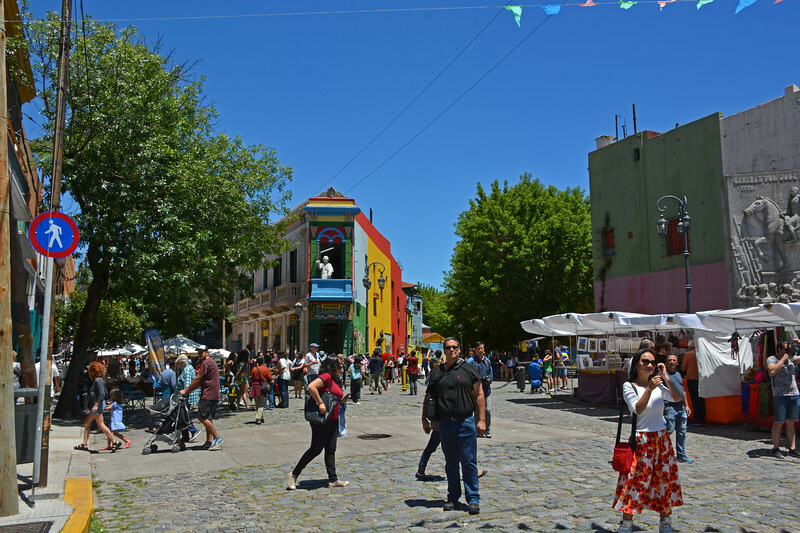 After admiring the more quiet side of La Boca, we finally reached the bustling touristic centre, namely a cobblestone strip, El Caminito (little walkway). 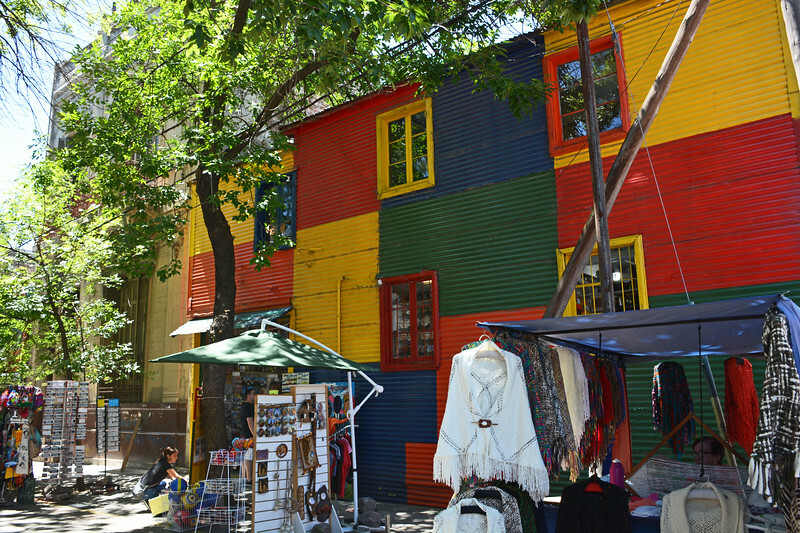 Named for a 1926 tango song, the pedestrian lane is flocked by a large crowd of tourists admiring the colourful conventillos (community style housing), populated with outdoor vendors selling their handcrafts, paintings, and souvenirs. 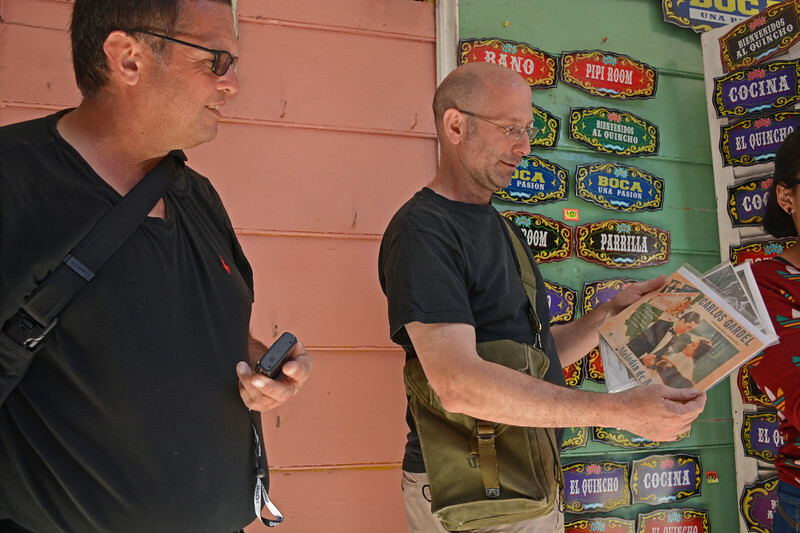 Touristy gimmicks of tango board cutouts are plentiful – but have a few pesos handy to pay for that photographic moment! 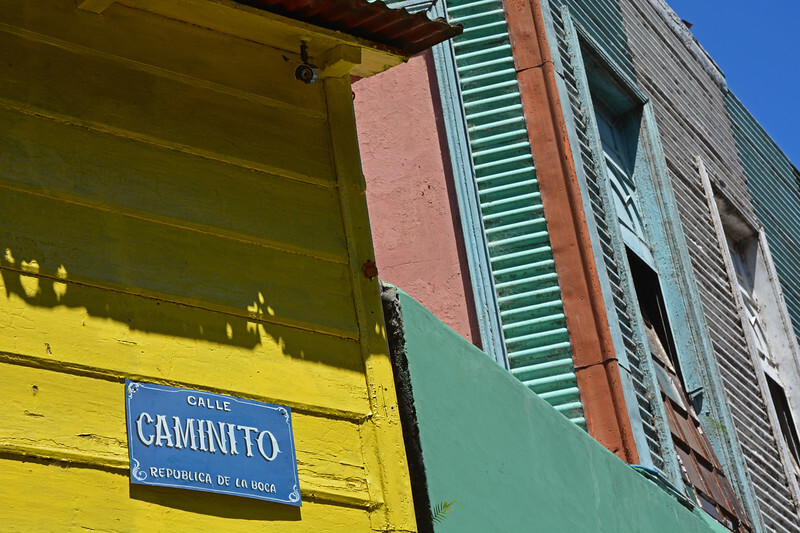 The bright coloured housing of El Caminito, emulates the early immigrants (1800s) who were so poor that they constructed their homes from cast-off shipping materials such as scrap metal, planks, and iron from the docks. 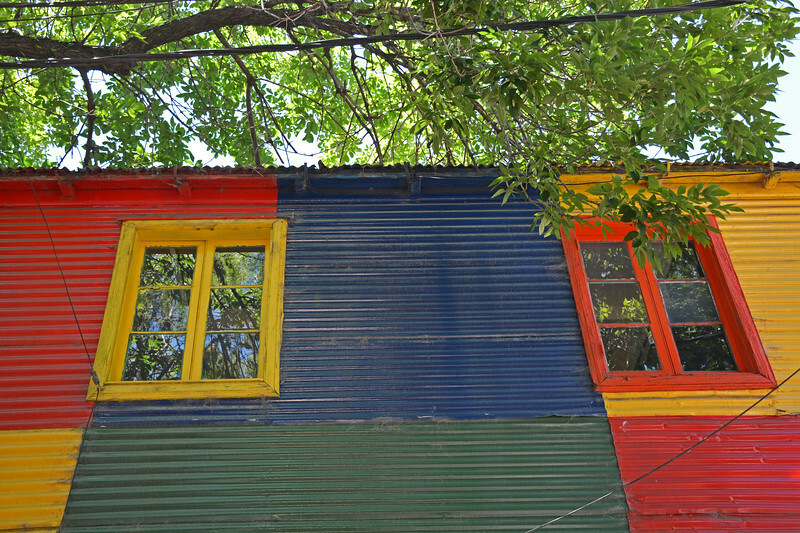 The shacks were then painted with bright colour (e.g., yellow, red, blue) leftover marine paint. In most cases, there was not enough colour of one paint to cover an entire house, so houses became works of colourful patchwork. Richard also took us to a historical site of a “preserved” (term used loosely as there is graffiti and paper mâché statues inside) 1880s conventillo (community housing). You can see the structure of what used to be (steps, rooms, etc.) which was very interesting. 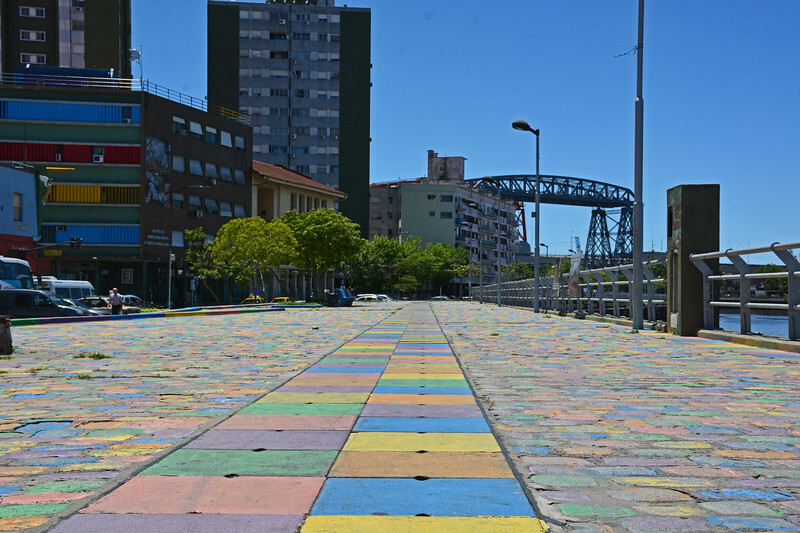 From the bustling street of El Caminito, we worked our way to the colourful boardwalk of La Boca – at the “mouth” of the River Riachuelo, where we caught a local bus to take us to San Telmo. 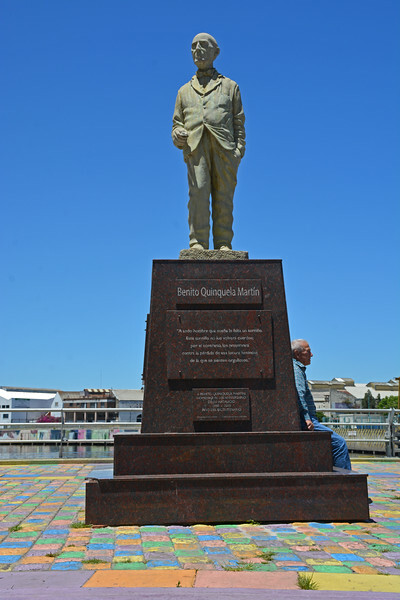 Along the board walk is a statue honouring local artist, Benito Q. Martin. 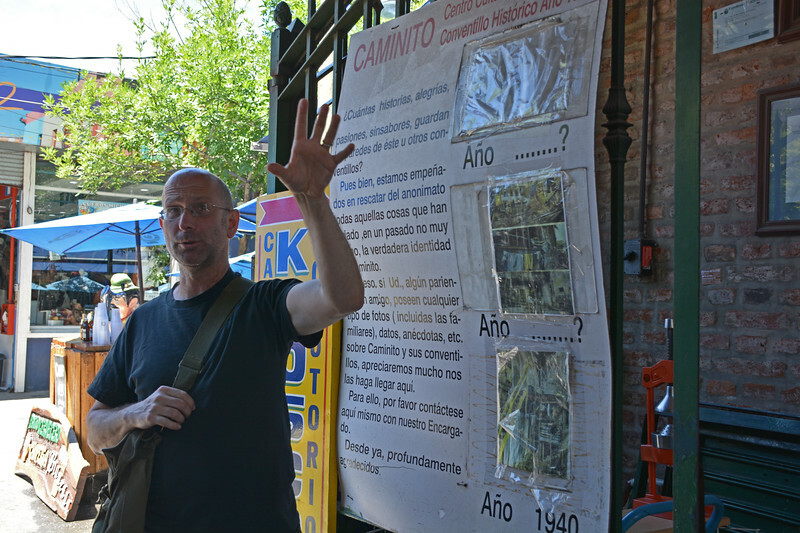 Historical Note: It was at the urging of local La Boca artist, Benito Q. Martin, the city government declared the street of El Caminito as an open-air museum in 1959. 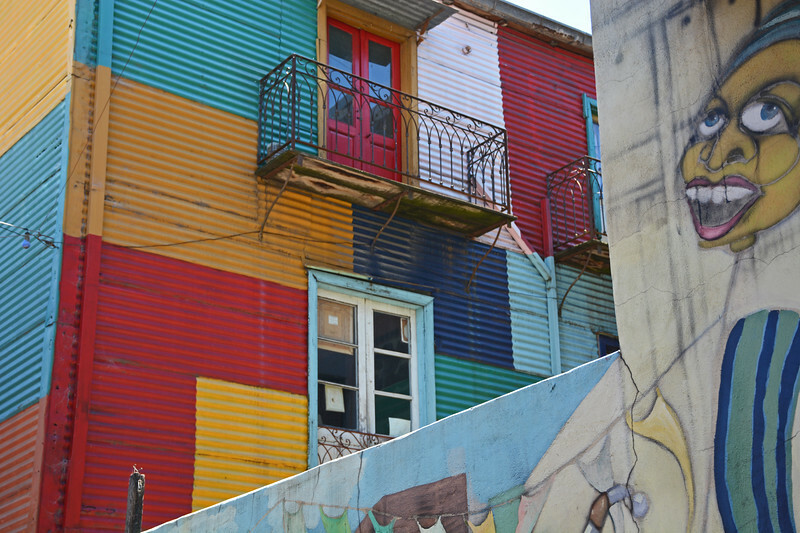 Martin was responsible for reviving the area in the 1950s, when he began to paint houses with bright colours, as like the early immigrants first did. 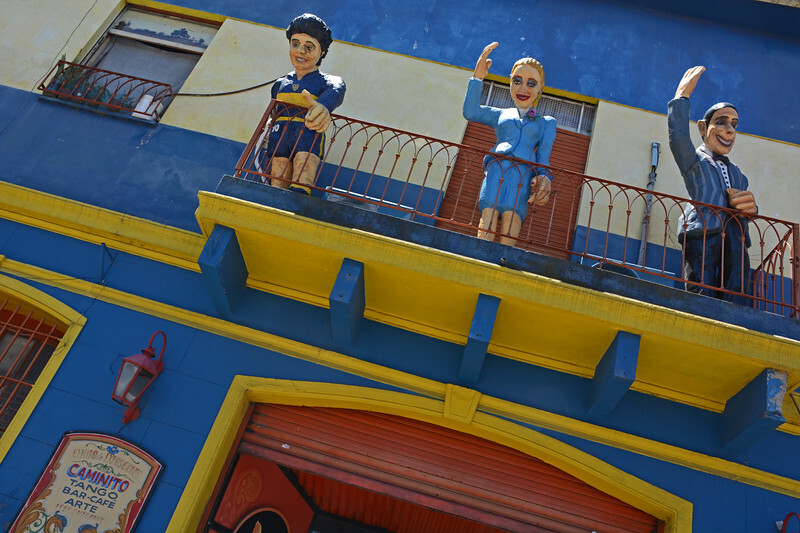 Although La Boca is now more famously known as a tourist trap, if you decide to visit, try and remember the historical significance of this area, why it is brightly coloured with hues that reflect the early settlement years. 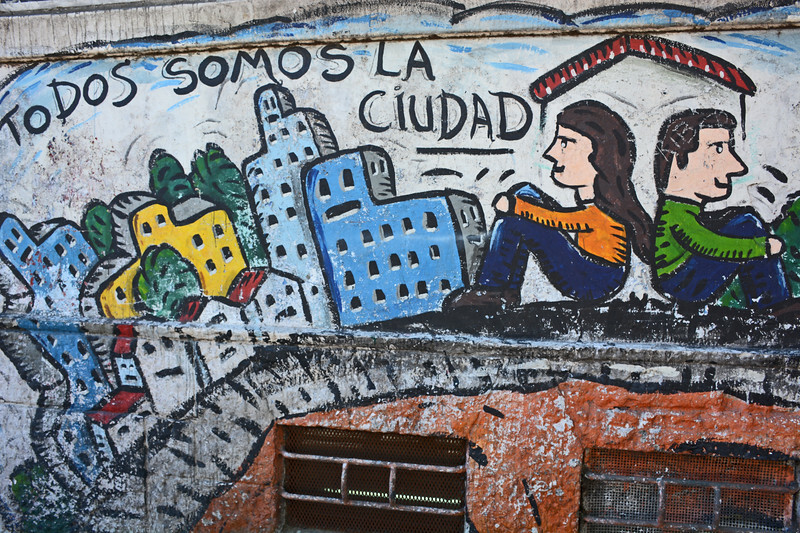 Real people built these houses and made their lives here, building a community of diverse migrants, and where most people believe the Tango (a dance of the peoples) was born. On our way to San Telmo! 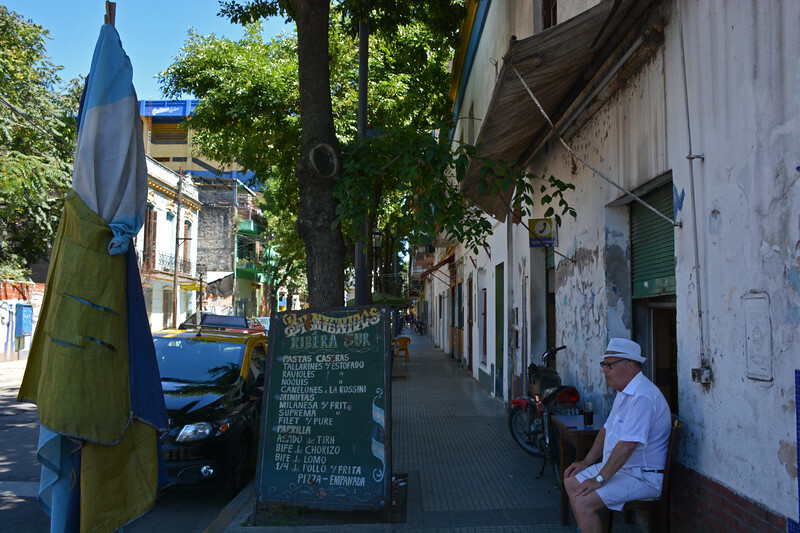 The barrio of San Telmo (named after the patron saint of seafarers, San Pedro González Telmo) dates back to the 17th century and is considered the oldest neighbourhood of Buenos Aires. This timeless barrio was a home to dockworkers and brick-makers and has survived revolutions, epidemics (e.g., cholera, yellow fever of 1871), and protests along its narrow cobblestone streets and centuries-old colonial mansion homes, which the latter is a reflection of the brief period in which it was one of the wealthier neighbourhoods of Buenos Aires. 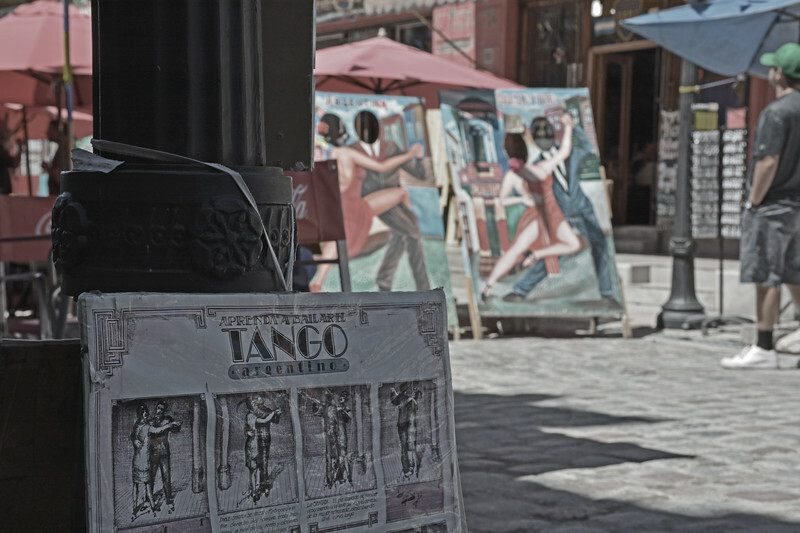 Today, it has a more “Bohemian” feel with its artistic residents and also is considered a hotspot for the Tango. 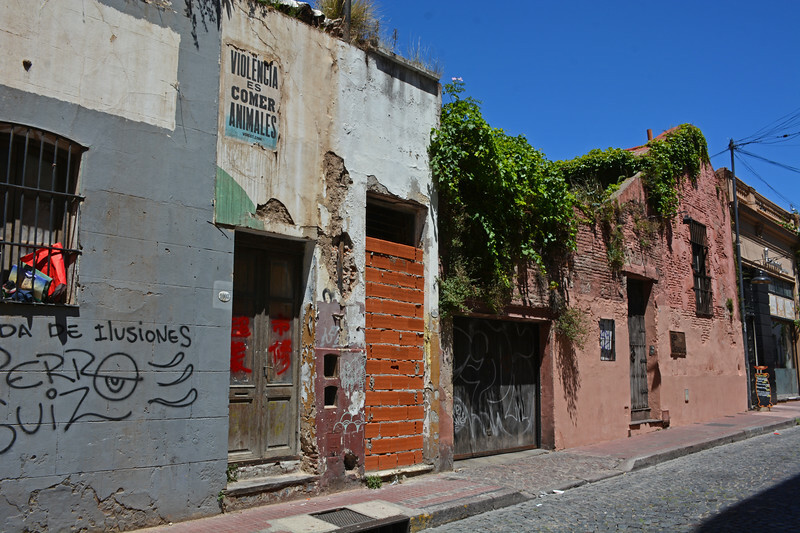 In fact, despite La Boca’s claims, many say that this barrio is the birthplace of the Tango! 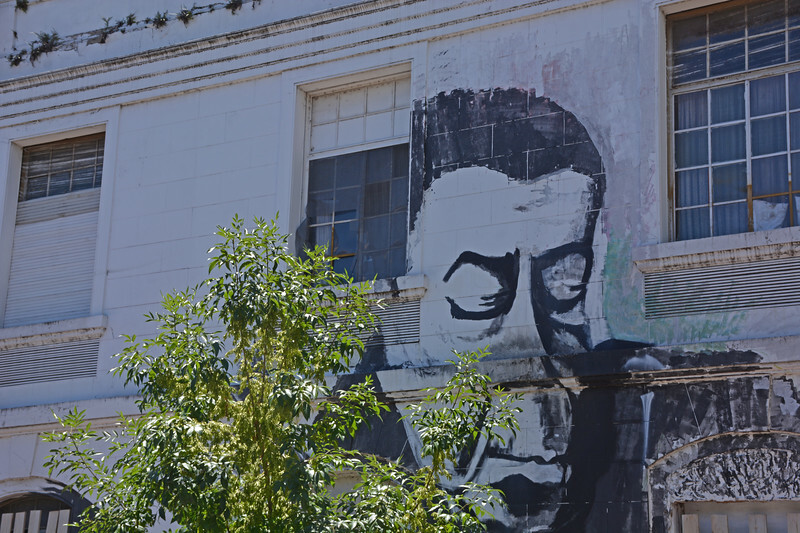 I will leave it to your own personal discretion and interpretation whether or not the tango was birthed in La Boca, San Telmo, or perhaps Montevideo, Uruguay! for now … let’s continue on our tour! 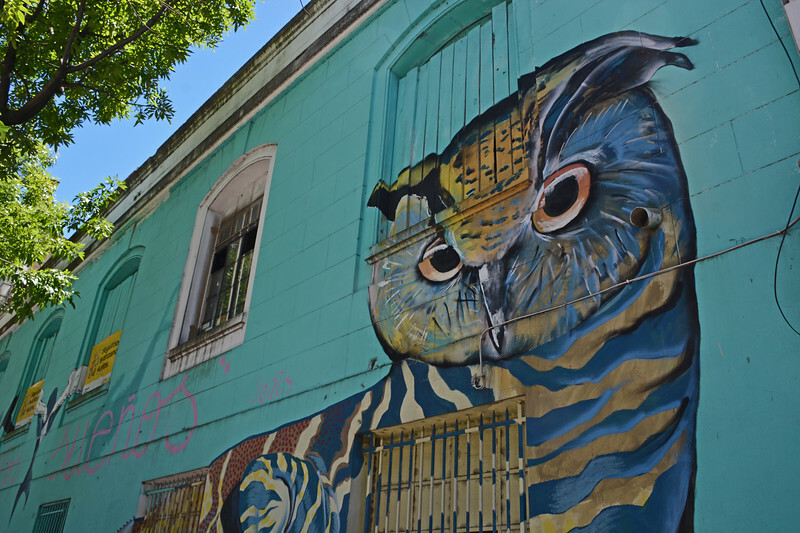 When we disembarked the bus, we walked a short while through the off beaten path of San Telmo and were able to appreciate additional street art. 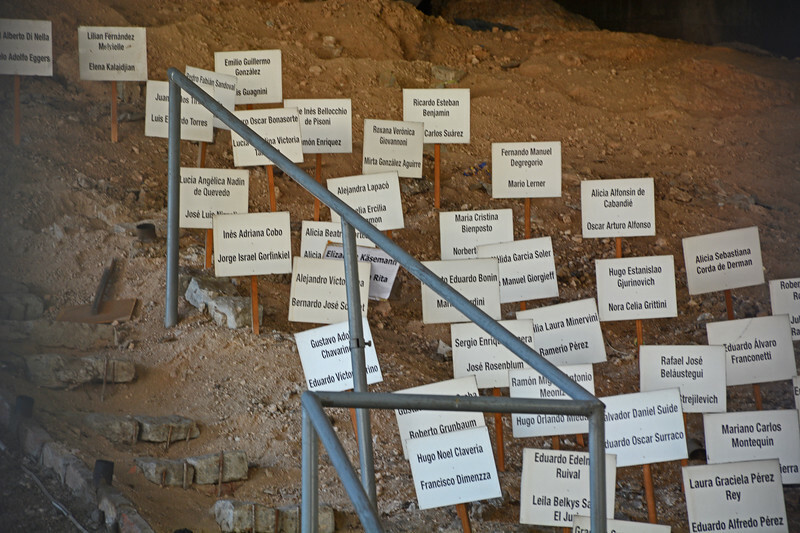 I still really do not have many words with how I felt observing this massive grave site, with sticks of paper coming out of the ground, documenting victim names. 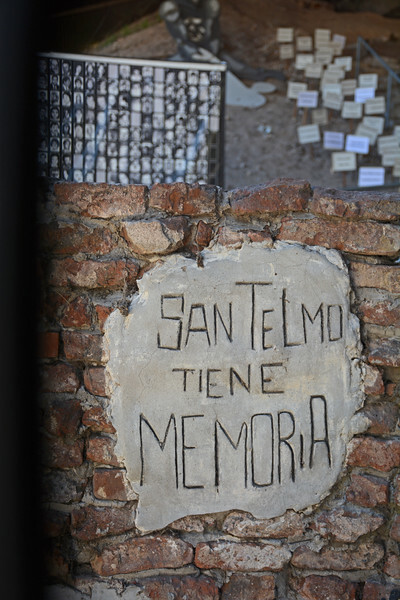 From the grave / excavation site, we continued walking the unbeaten paths of San Telmo, observing more interesting art graffiti, as we leisurely walked the quiet streets. 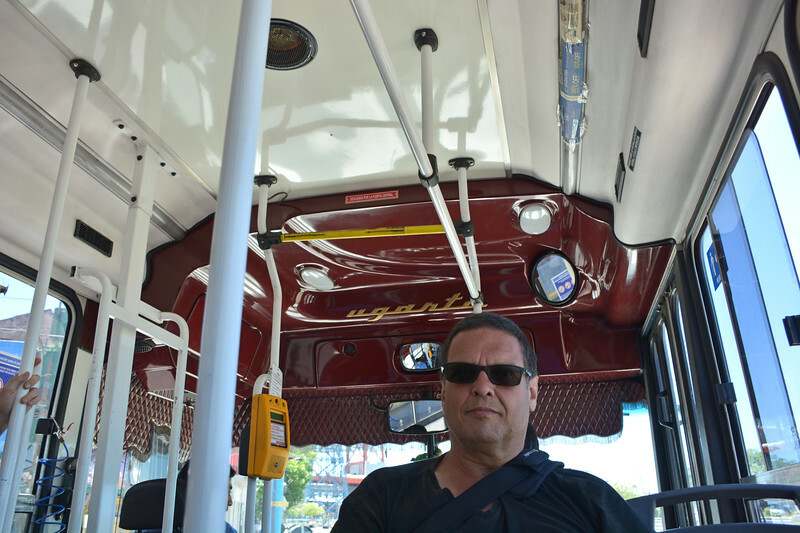 We then arrived at the bustling heart of the barrio. We were fortunate to have visited this neighbourhood on a Sunday! 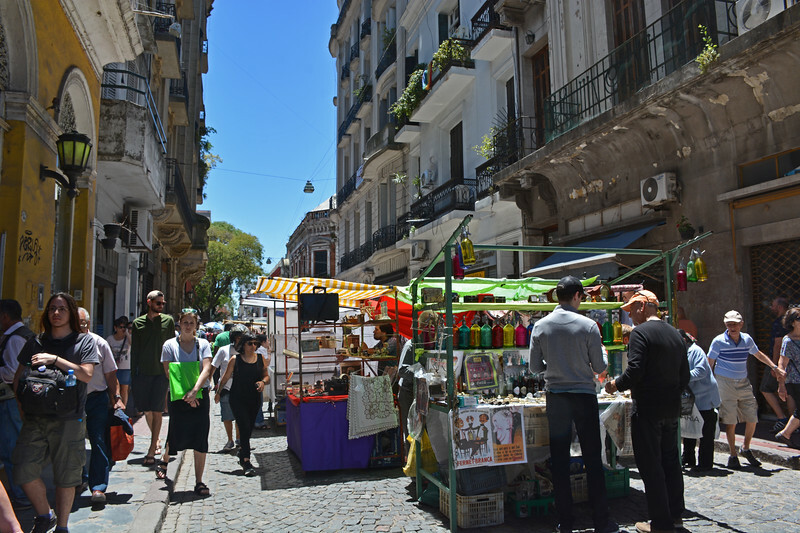 This gave us the opportunity to not only experience the indoor covered market of “Mercado de San Telmo”, but more importantly experience San Telmo’s “Feria” or Sunday Market that is held every Sunday throughout the year and might be considered the barrio’s most famous attraction. 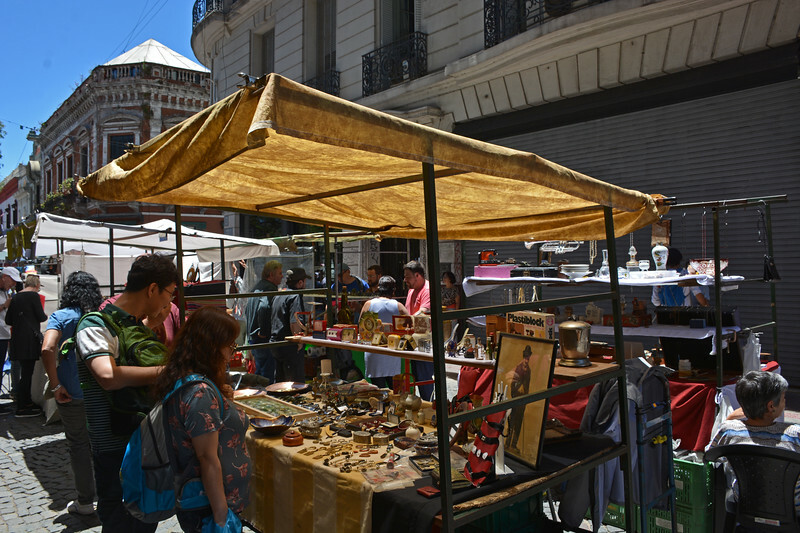 Locals fill up Calle Defensa and Plaza Dorrego with open-air stalls selling antiques, handcrafts, and souvenirs. 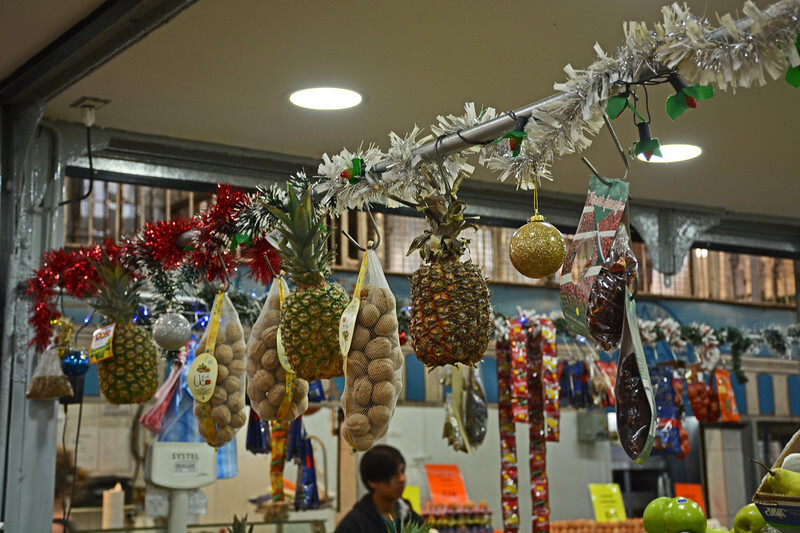 First off, the indoor market – “Mercado de San Telmo”. Definitely worth a visit, this market was built circa 1897 (end of 19th century) and interestingly enough designed by the same architect (Juan A. Buschiazzo) as the Recoleta cemetery. It’s initial intent and purpose was to serve the increasing number of migrants living in the area as a centralized fruit and vegetable market. 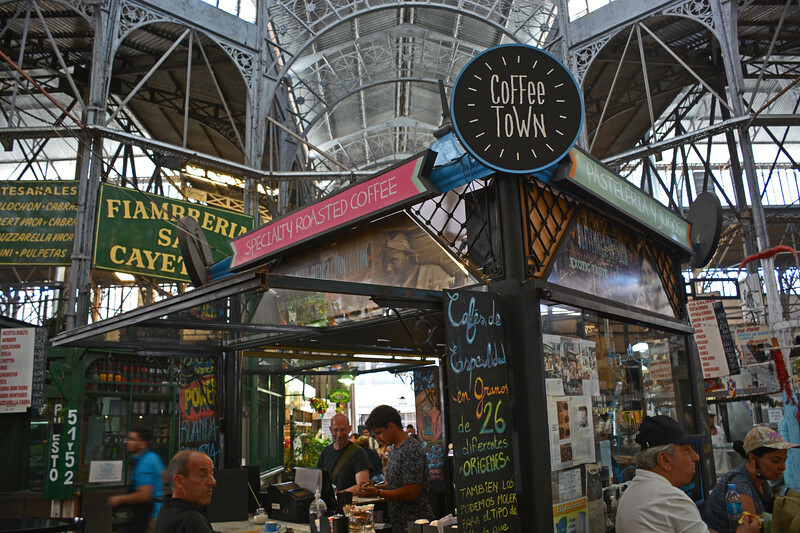 This indoor market has been declared a National Monument of Argentina, due to its historic significance and its original structure of metal arches, columns, and glass atrium; that have been carefully maintained. 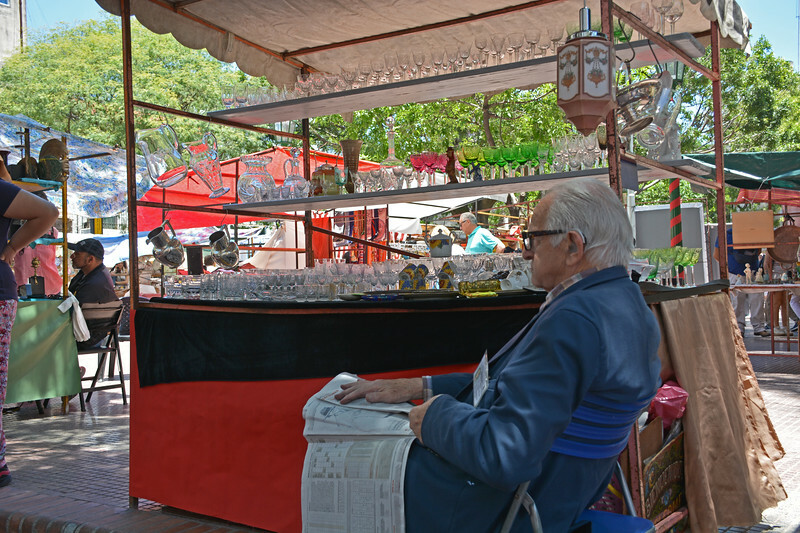 Outdoors, we were treated to the interesting and famous, Sunday street fair, known as the “Feria de San Telmo”. 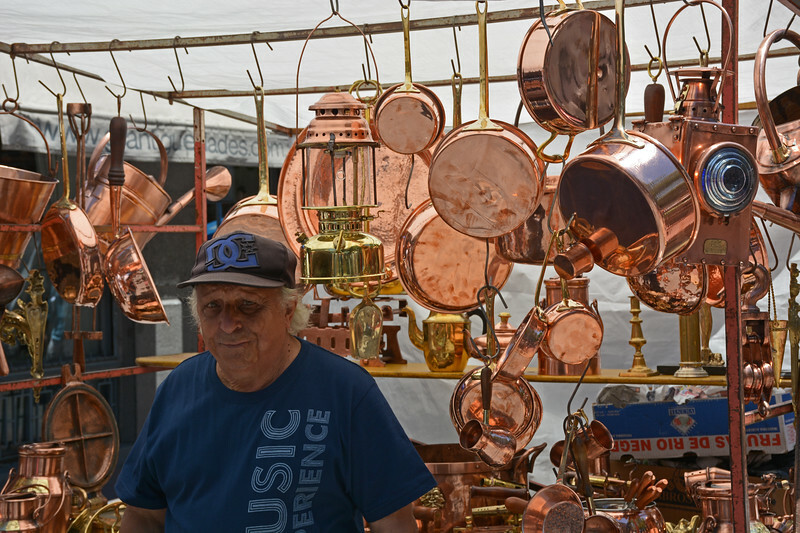 This Sunday fair began in ~ 1971 as an antiques market on Plaza Dorrego; but now has grown in size to where locals fill up not only the Plaza, but also encompasses the many blocks of the cobblestone street, Calle Defensa, where this great street bazaar attracts thousands of locals and visitors each Sunday. 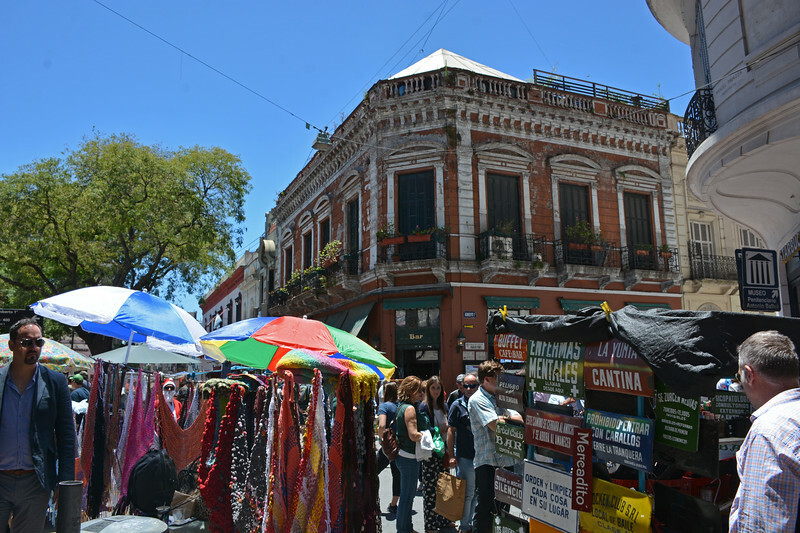 This street is completely pedestrian, although we did have a coco-loco resident trying to drive his car through the crowded street that was lined with not only antique stalls, but original art, souvenirs, snacks, and well, anything really that you could sell. Richard assisted Anthony is finding an authentic “Mate” cup and straw, after visiting several vendors who vied for their business. 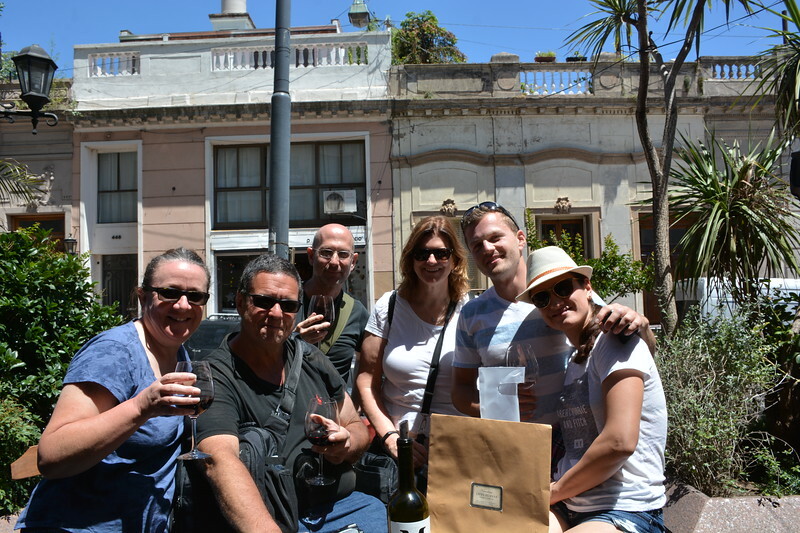 We ended our day in San Telmo at a wine shop, sitting around an old barrel with new friends and our guide Richard; sipping, tasting, sampling some extraordinary Argentinian wines (our favourite being “M” – mmmmmmmm!). 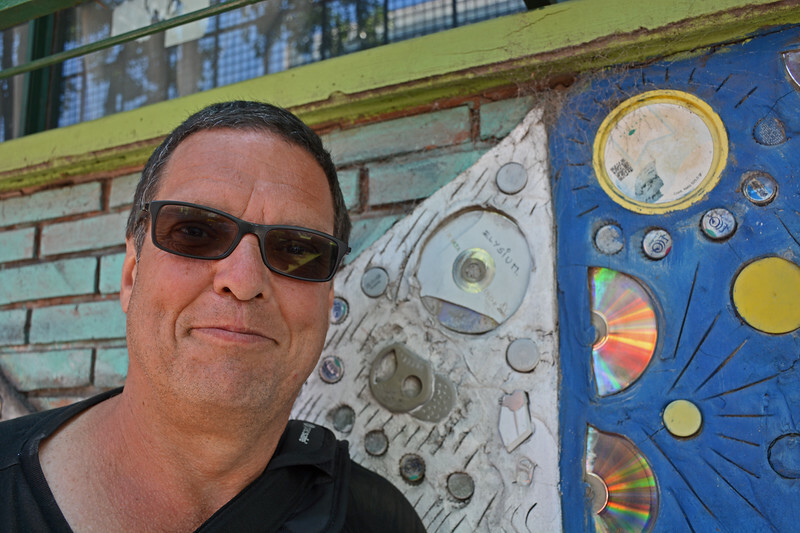 From the wine shoppe, we up a street to view the original home of Juan Carlos Castagnino. 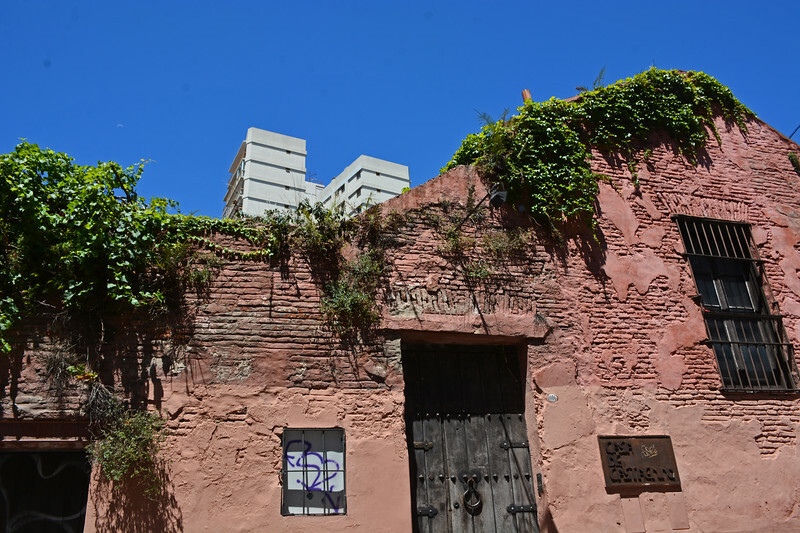 This old pink house dates back to the late eighteenth century and was the home of artist, Juan Carlos Castagnino who was most known for his illustrations within the Martín Fierro poem (by José Hernández). 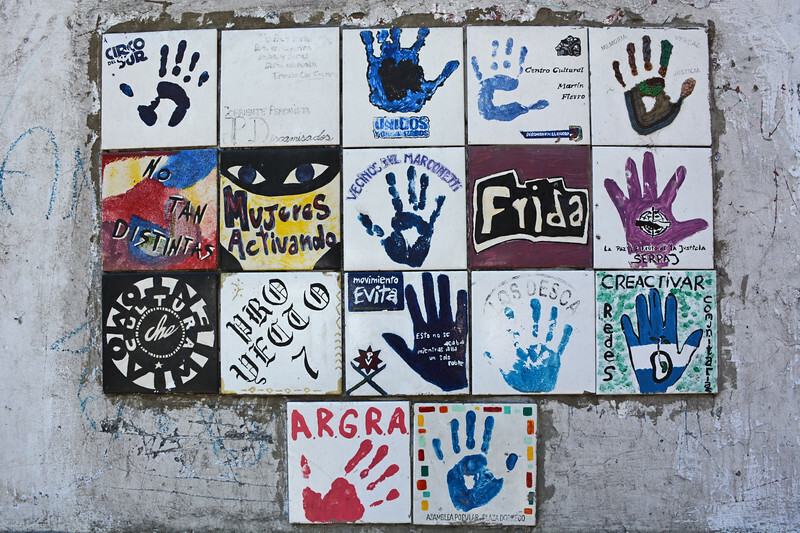 Juan was dubbed a “social painter” as he was an artist who used his craft to denounce social injustice during his time. 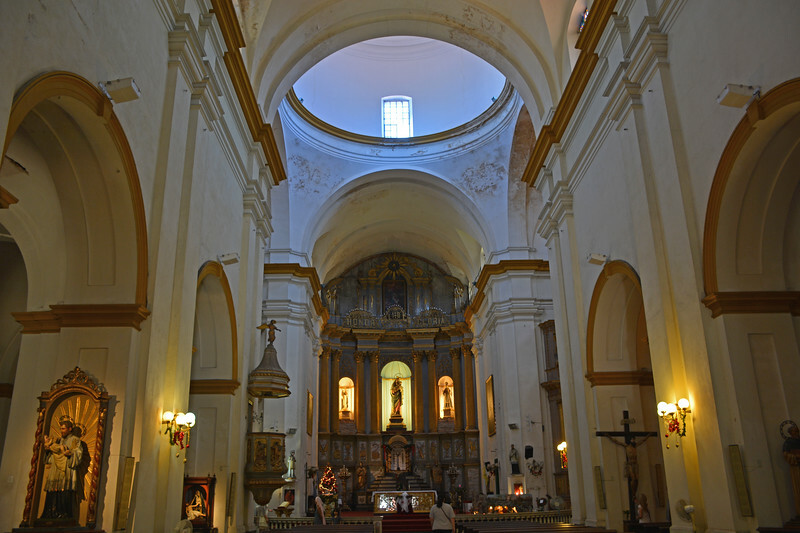 We had one last stop before catching our van to the pier, the ornate church of San Pedro Gonzalez Telmo. 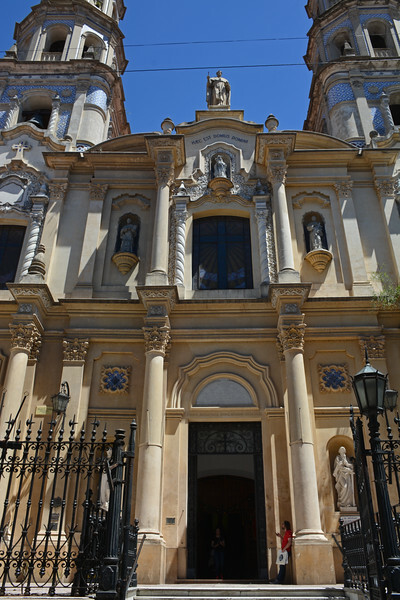 This church also known as Nuestra Señora de Belén (Our Lady of Bethelehem) is one of the oldest (circa ~1806) in Buenos Aires. After a quick visit, we met our pre-arranged van to take us back to the cruise pier as we finished our final day in the great city of Buenos Aires. 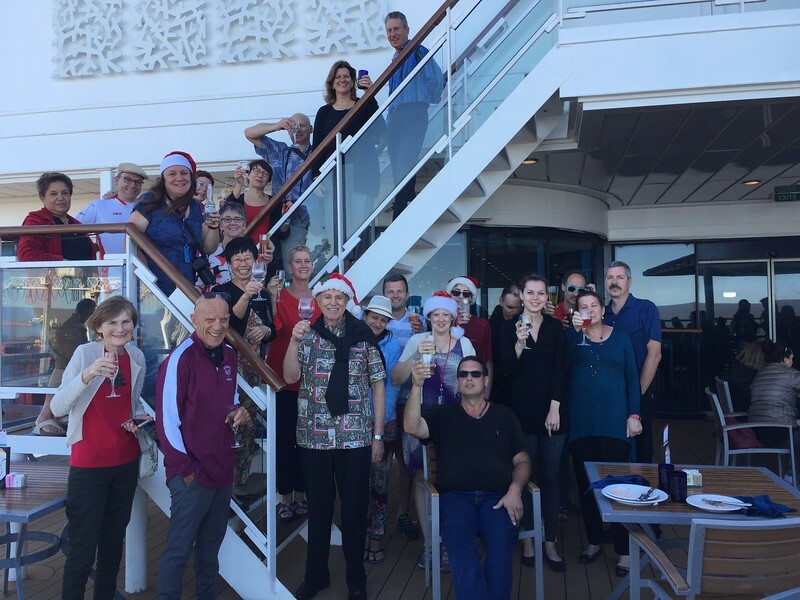 Our roll call group gathered at 5 PM on Deck 10 AFT at the Oceanview Bar for a Sail Away Party. It was lovely to meet our fellow peeps from Cruise Critic, many of which we would later see during shared private excursions. 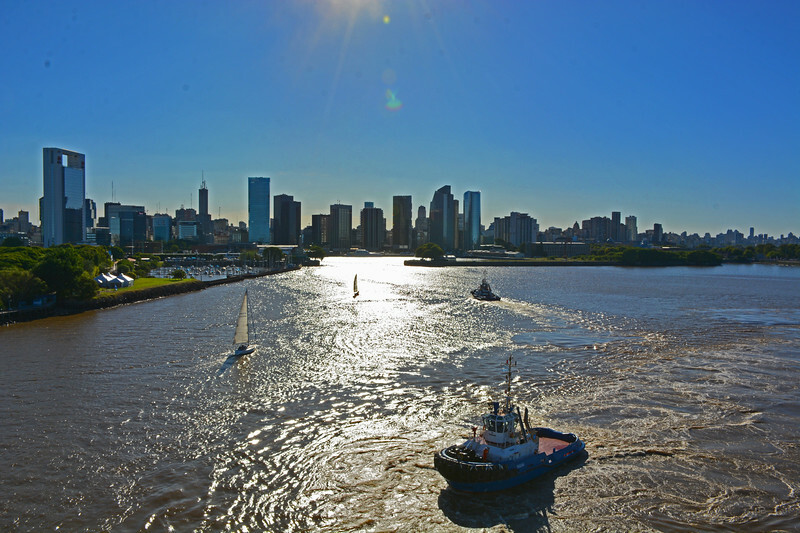 It’s always a pleasure to meet such great folks as we sail away from our embarkation port.